A study concerning lacrosse injuries in high school-aged boys and girls co-authored by Richard Hinton, an executive committee member of the US Lacrosse Sports Science and Safety Committee, was published in the September 2005 issue of the American Journal of Sports Medicine. Its findings concluded that both boys' and girls' lacrosse are relatively safe sports, with most injuries involving sprains, strains, contusions and abrasions. For boys and girls high school lacrosse, the most common injury was an ankle ligament sprain from non-contact means like dodging and cutting. 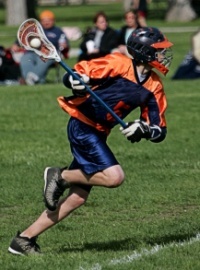 Male lacrosse players are required to wear helmets, padded gloves, elbow pads, chest and shoulder pads and groin cups. Injury data hasn't demonstrated a need for female lacrosse players to wear helmets though eye protection and mouth guards are required. While lacrosse is listed by the NCAA as a "collision sport", in the same category with football and ice hockey, it has lower reported injury rates than those sports. The specific injury patterns derived from ongoing NCAA statistics reporting reflect these different general injury categories: Lower body injuries to ankles and knees, shoulder injuries in men’s lacrosse, hand and wrist injuries and head concussions. Injuries to the wrist and hand nearly always occur from a direct blow. Although the gloves are padded, they are softer and more flexible than hockey gloves to allow for greater dexterity of the fingers. Phalangeal fractures are relatively common from the entrapment of the grasped fingers against the metal shaft of the player’s own stick. Men’s lacrosse allows body checks and tackles within certain proscribed limits. Clavicle fractures and acromioclavicular injuries, shoulder separations, are most commonly seen from collision with another player or fall onto the point of the shoulder. Furthermore, the added length provided by the lacrosse stick creates a long lever arm that could generate increased torque on the shoulder when a player falls or is struck with the arm away from the body. These factors combine to result in the relatively high rate of shoulder injuries as compared to other contact sports. In fact, the shoulder is the most frequently injured body part during games. For goalies, lacrosse injuries usually result from being struck with a high velocity shot. Because no pads are worn on the lower extremities, leg injuries commonly occur. According to the NCAA, the body parts most frequently injured were the ankle, upper leg, and knee, which combined accounted for 48% of all lacrosse injuries. Knee injuries are among the most commonly observed in the sport of lacrosse because of the quick pivoting footwork to avoid an opponent with a dodge or cut which strains the knee. Unlike other overhead throwing sports, lacrosse appears to have a lower rate of over-use injuries. This is probably because the throwing that occurs uses a stick but the elbows are kept close to the torso while the stick does the work. Both US Lacrosse and the NCAA have set regulations that require the use of protective equipment designed mainly to protect the head and upper extremities. Men's lacrosse is sometimes perceived to be a violent sport, but injury statistics do not support this claim according to NCAA Injury Rates. Approximately 40% of lacrosse injuries are non-contact. United States Lacrosse insurance data showed that 42% of all claims dollars were paid for knee injuries and 50% of the claims were paid out to high school players. 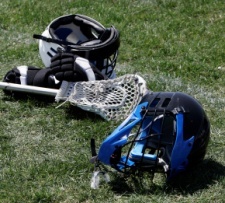 Helmet standards were developed in the 1960s and 70s when there were epidemic levels of deaths from severe brain injury in contact sports, according to US Lacrosse. Statistics show that the use of Lacrosse helmets deters catastrophic brain injuries though concussions do occur. The non-contact or incidental contact in women’s lacrosse has proved that the need for extensive protective equipment, including helmets, is not necessary. Protection of the face, eyes and mouth, are required. Some girls prefer to wear a non-padded glove and nose guards are often opted for. It's important for parents and coaches of lacrosse players to become familiar with the common lacrosse injuries of the sport. As with any sport, injuries are possible. Understanding which injuries are the most probable will lead to better immediate treatment and a shorter recovery period for the lacrosse athlete. Kalynn Amadio is a Lacrosse parent. Visit her comprehensive information rich site, Lacrosse-Information to learn more valuable tips on How to Play Lacrosse.